TV Celebrity Chef Alan Coxon has created a unique multi award winning historic food range including a Mediaeval old English Ale-Gar using an Ale recipe once drank by Queen Elizabeth 1st, a Roman Vinegar using herbs and spices favoured back then, and an Ancient Greek Vinaigre with a recipe taken from the time of the first ever Olympic games. After ten years of development and research I am proud to have created a totally new and unique product. My unique Ale brew used to produce ‘AleGar’™ has been recreated using an original 15th century Mediaeval old English Ale recipe. The Ale-Gar™, with its deep dark colour and hints of chocolate, cinnamon and roasted malt has a unique flavour, as well as being the biggest Ale-turnative to a Balsamic vinegar in its history, it’s also a perfect Ale-Turnative to a Worcestershire sauce or even a healthier Ale-Turnative to a soy sauce!. All the ingredients are specifically sourced for quality and are all natural with no additives, colourants or undesirables whatsoever. The ultimate healthy seasoning and dressing all rolled into one! The Ancient Greeks were historically respected far and wide as leaders in the culinary field. The dominant flavours of Greek cuisine were honey, vinegar, fish sauce and a few carefully balanced herbs and spices. My Ancient Geek Vinaigre has taken a route of balance and simplicity, while bringing out the individual flavours. The sweetness comes from the vine fruits, a slight bitterness from the coriander and a clean, fresh acidity from the wine. The aroma is light, fruity and fragrant befitting of a Greek goddess and possibly why it is a favourite of the ladies. This true wine vinegar will give you a kick and kiss at the same time. My research and influences for the Roman Vinaigre has derived from three of Ancient Rome’s greatest gastronomes, all named Apicious, and lived during the rise of Julius and Augustus Caesar, Emperors Tiberius and Trajan. Needless to say, by the end of the first century AD the name Apicious had become a symbol of wealth and all of the good things in life. This Roman Vinaigre was made using quality wine, brewed naturally and then infused with some of Ancient Rome’s favourite spices. Look out for warming flavours such as cinnamon, hints of camomile and a touch of peppercorn, sweetened by one of the oldest sugars known to man, honey – a favourite and much used ingredient in the Roman period. Please visit my website to discover more of the culinary history behind these products, how you might want to use them and to purchase from my online store. 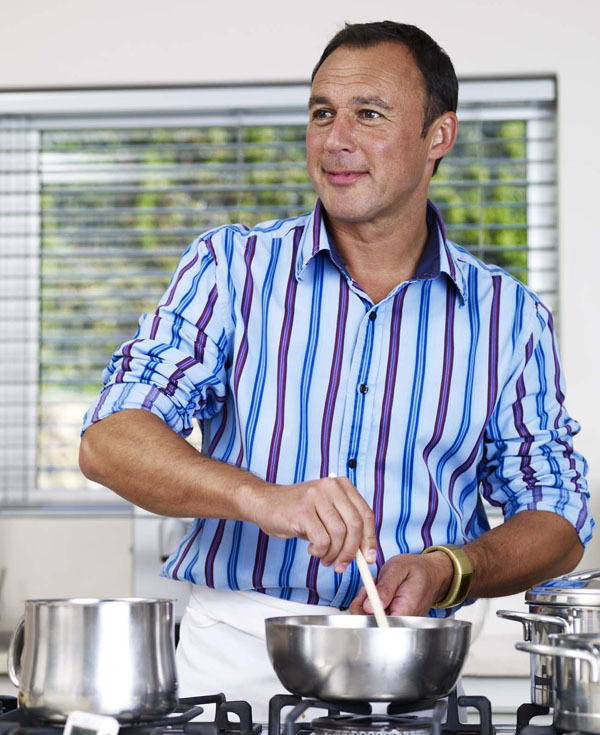 Alan is also available for cookery shows and demonstrations.